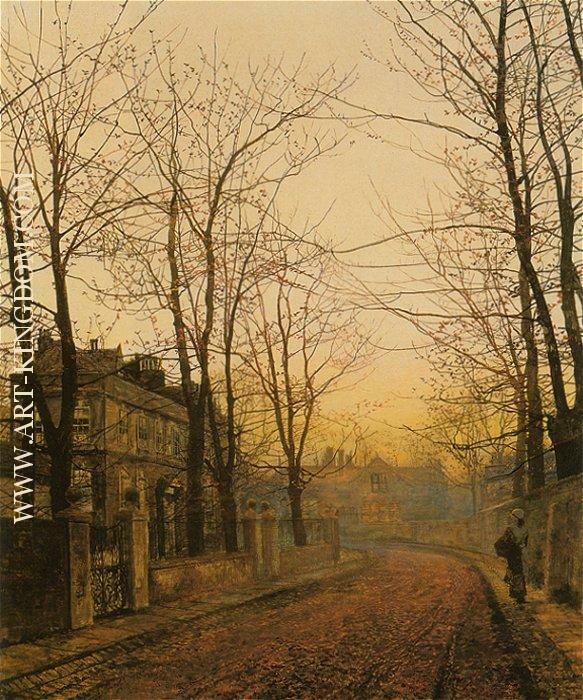 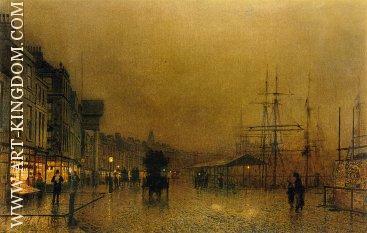 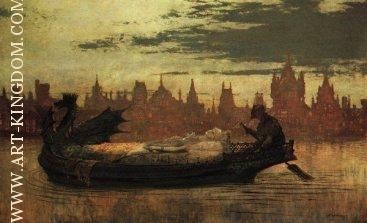 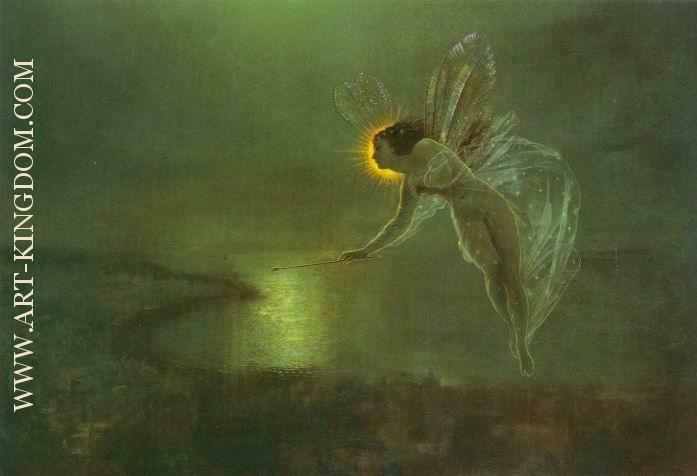 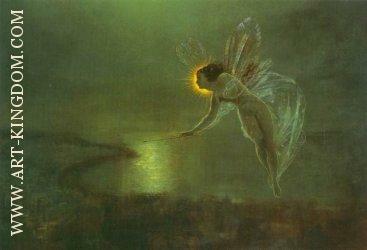 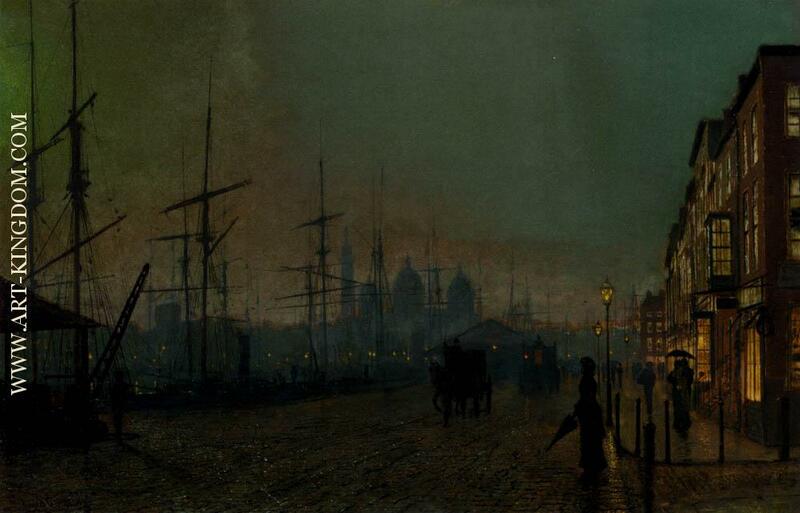 Atkinson Grimshaw was born in Leeds, his father was a policeman, & he started work as a railway clerk. 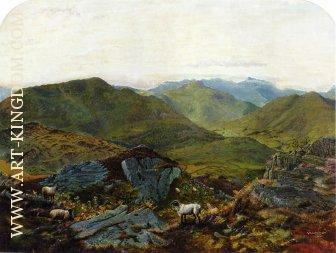 His parents were opposed to his taking up art as a career. 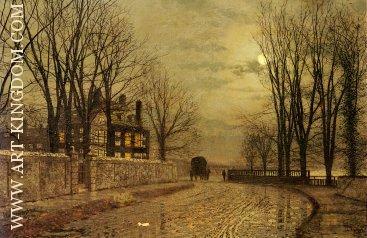 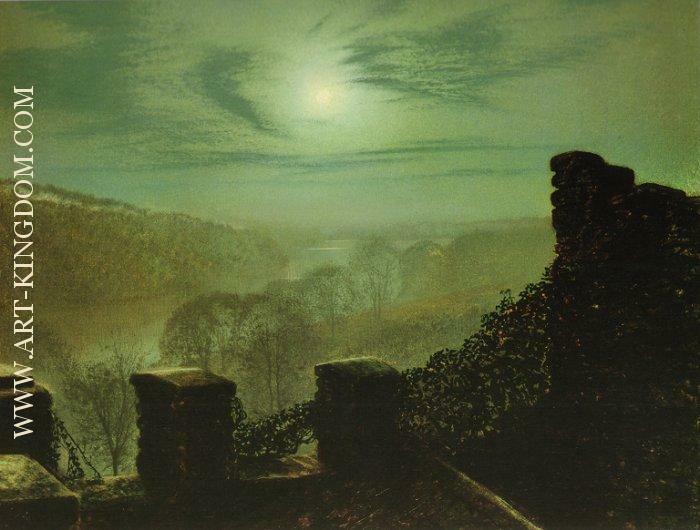 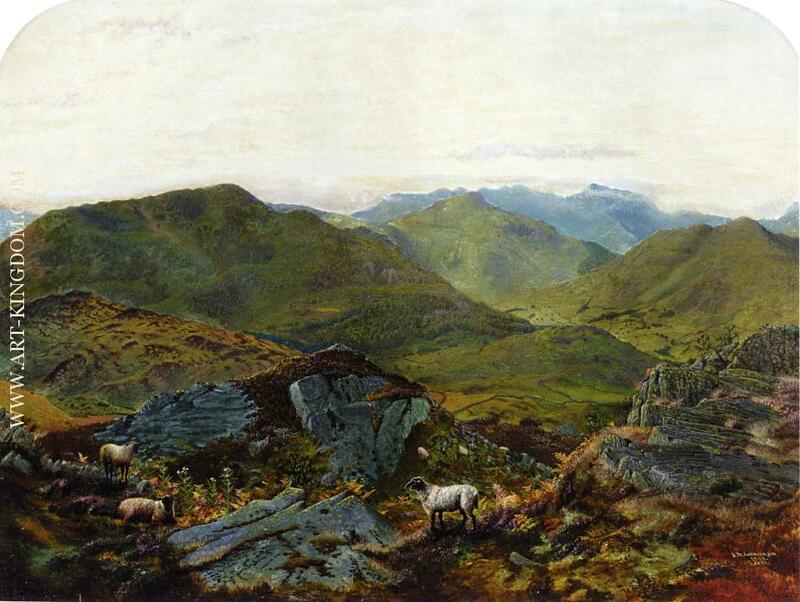 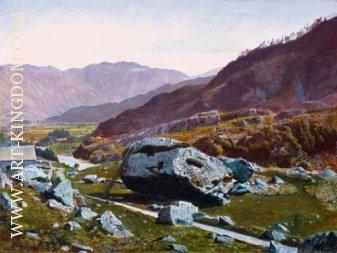 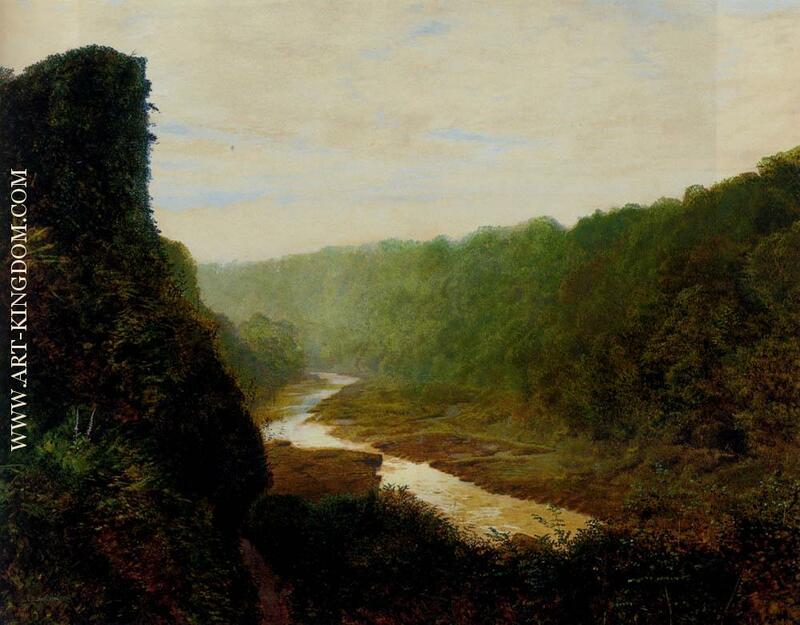 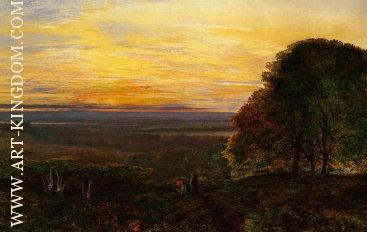 Grimshaw was influenced by the Pre-Raphaelites, & in his youth produced vivid, highly finished landscapes. 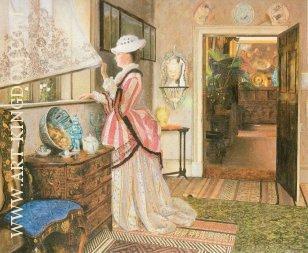 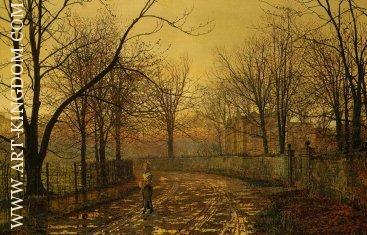 Gradually, Grimshaw developed his own highly distinctive style, & subject matter. 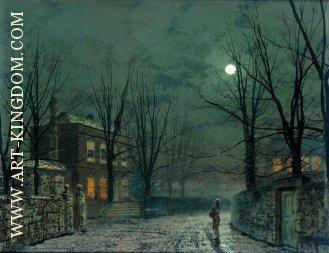 He became a consummate painter of twilight, night time, & autumnal scenes. 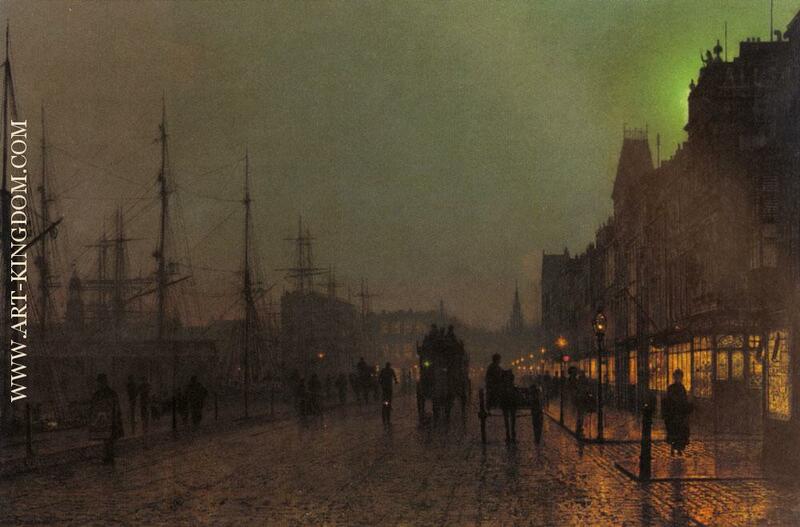 Grimshaw spent holidays at Scarborough, & many of his pictures were set there, & in Whitby. 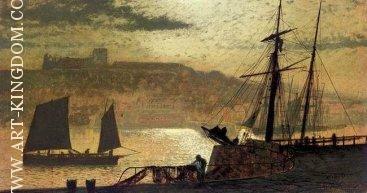 He also painted nocturnal harbour & dockside pictures. 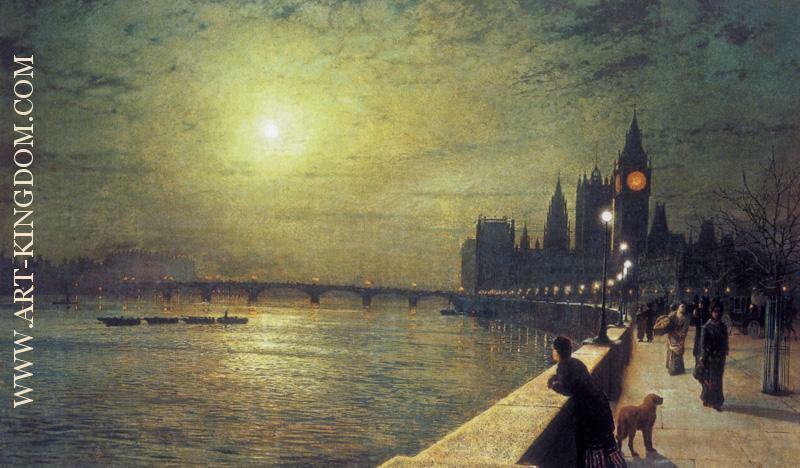 He spent some time in London. 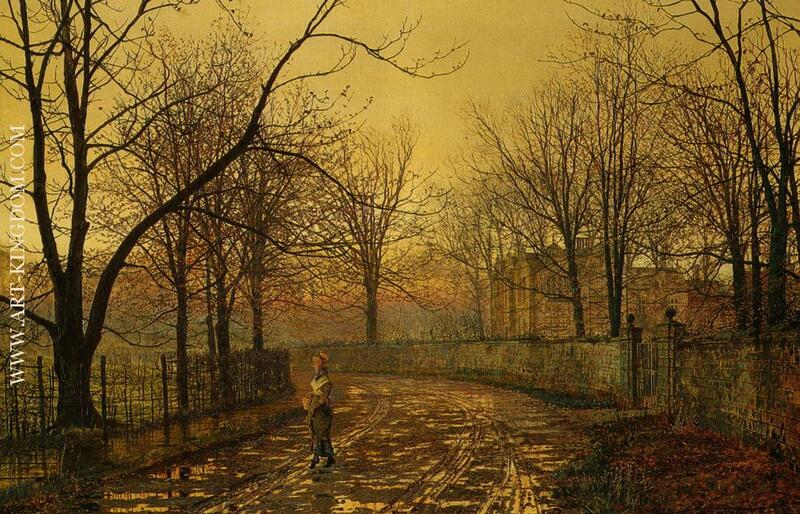 Grimshaw was, though, a Northerner, & Leeds remained his base, & his commercial success allowed him to buy Knostrop Hall on the outskirts of the city. 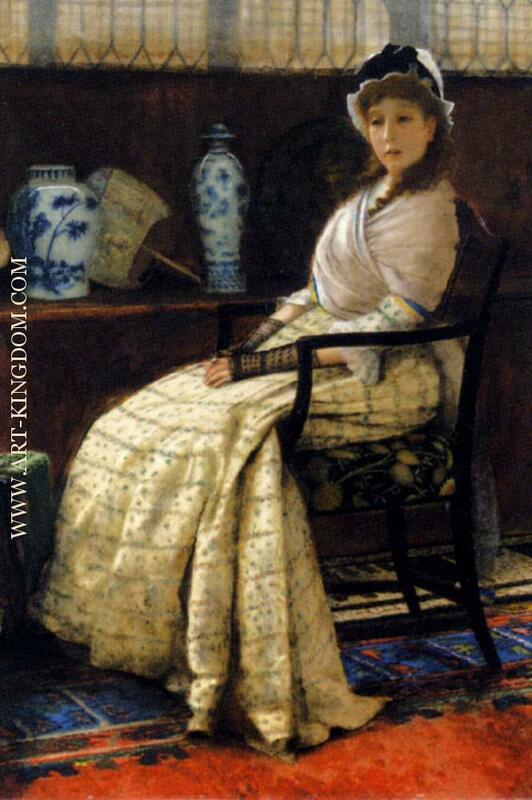 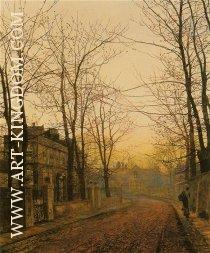 For a short time in the mid 1880s, he did have a London Studio.It is rumoured that he was a friend of Whistler. 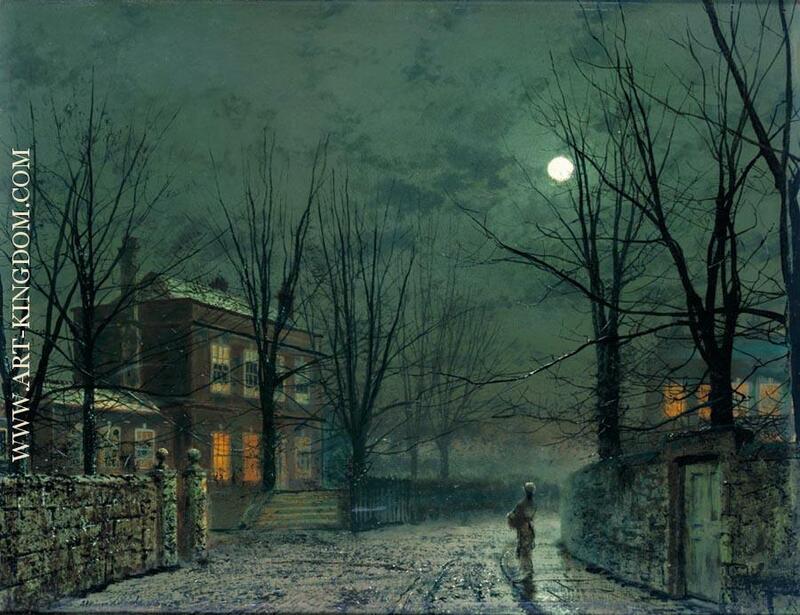 Grimshaw’s output was much more varied than just this however. 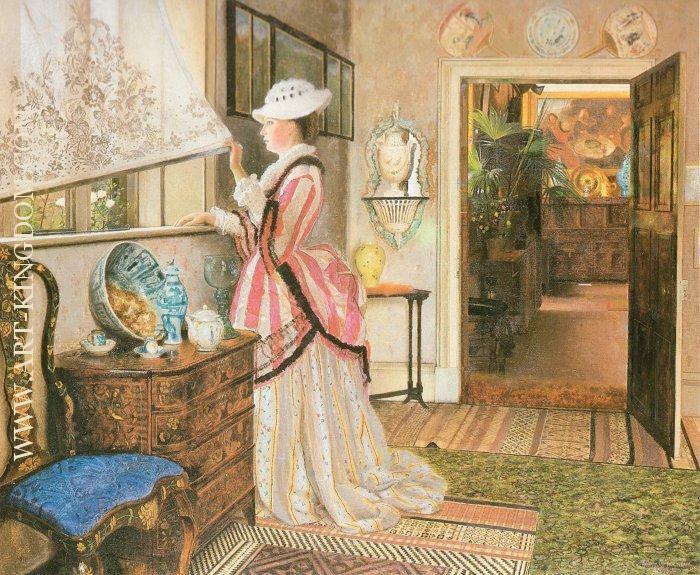 He painted portraits, interiors, fairy pictures, & most accomplished fancy pictures, of attractive gorgeously dressed young women in opulent interiors. 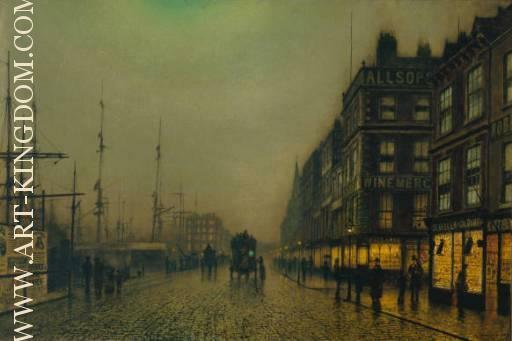 In the early 1890s Grimshaw’s style seemed to be developing in new directions, three pictures showing this are Sand, Sea, Summer, & Fantasy of 1892, & At Anchor 1893. 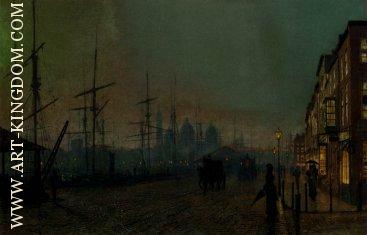 He seemed to be moving towards a freer, less formal style of painting, perhaps influenced to a degree by Whistler. 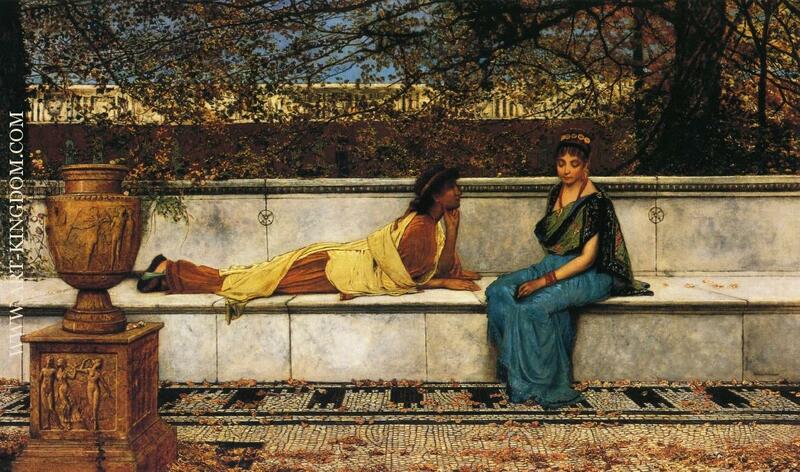 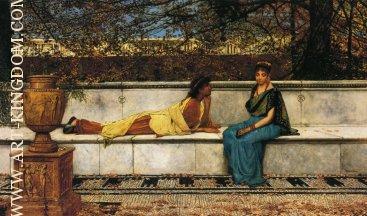 Unhappily this change of direction was not to, be as Grimshaw died of cancer in 1893.